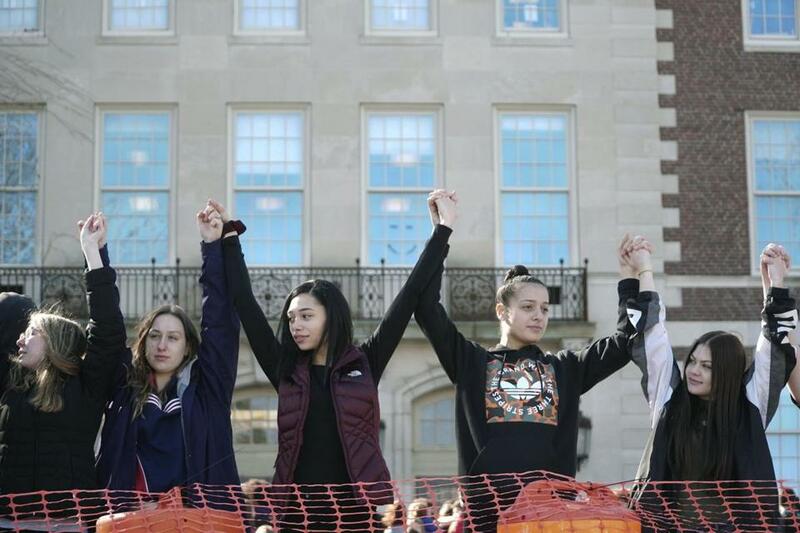 Students at Pittsfield High School in Massachusetts demonstrated for school safety on Tuesday. PARKLAND, Fla. — Florida’s governor said Tuesday that he’s determined to make the Parkland school shooting the last the state ever experiences. Governor Rick Scott met with Miami-Dade County officials to outline a plan to pass a school safety bill before the state’s annual legislative session ends next Friday. Scott says he wants to spend $500 million to increase law enforcement and mental health counselors at schools, to make buildings more secure with metal detectors, and to create an anonymous tip line. ‘‘There are laws in place that if they had been followed, that shooter could have been stopped so many times it makes your head spin. So passing more laws dealing with guns as a solution to a problem that exists within the enforcement of laws is just kind of silly,’’ Hammer said. ‘‘If you can’t legally buy a beer in Florida, why should you be able to legally obtain a weapon of war that can kill people?’’ Schulman said. ‘‘Our children lost a friend. Our friend lost a daughter. This is your opportunity. The world is watching,’’ she told the committee. A Tuesday morning hearing in the criminal case against Cruz was canceled after lawyers reached an agreement for prosecutors to get hair samples, fingerprints, DNA, and photographs of him. He is charged with 17 counts of murder. ‘‘I just hope we have started a change and that something is going to come out of this,’’ said Charlotte Dixon, a sophomore who escaped unharmed during the shooting.